I'm not seeing where this method could be causing a memory leak. BallNode is not created here, so why is instruments pointing back to this location? How is this method causing a leak? The way you have it currently it is trying to evaluate self.children.count every iteration through the loop. This shouldn't cause a leak, but there could be something under the hood preventing it from being released correctly when evaluating it repeatedly. Also you may want to look at enumerateChildNodesWithName: as a quicker alternative than looking at every child and seeing if it is a BallNode. Hopefully that is the issue and is easily fixed. You keep creating more and more instances of your BallNode class. Try adding ball = nil; after your last if statement but honestly I do not know if that will help you. Either your code logic is wrong or there is other stuff going on which you did not post. Usually it would make sense for you to have an ivar of your ball which you would apply the posted code to. Not the answer you're looking for? Browse other questions tagged objective-c memory-leaks sprite-kit skshapenode or ask your own question. 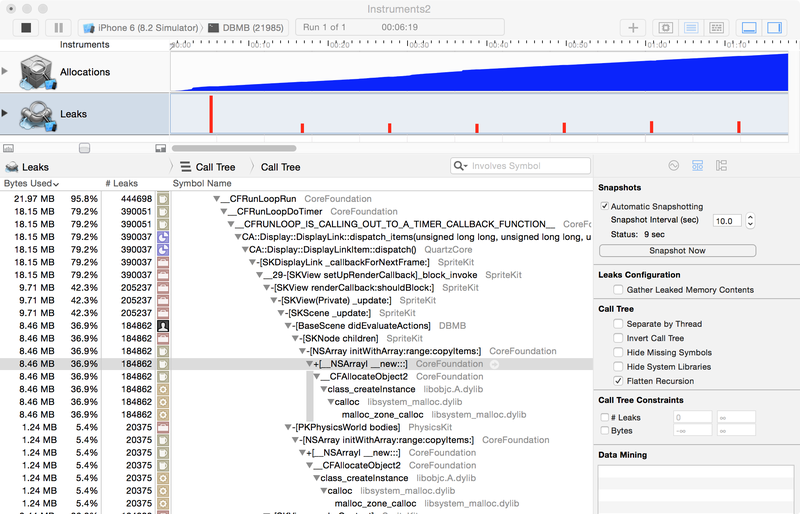 Why is there a memory leak at String creation in swift? How to fix the memory leaks in Objective-C?